Welcome to Walnut Tree Lodge No. 5533. We are in the Province of Essex and are warranted under the United Grand Lodge of England. This lodge was founded on the 15th October 1935. Our meetings are now held in Upminster and we always welcome new members to join us. Being a friendly and sociable lodge, we have a full programme of meetings and events planned for this and next year. Below is a list of events we plan to organise or attend. These may include ceremonies for the initiation of new candidates who want to become freemasons, Ladies Nights and charity fund raising events. Walnut Tree LoI Chinese night is on the 1st May. Walnut Tree LoI starts again on the 15th May. .Freemasonry is one of the world’s oldest and largest non religious, non political, fraternal and charitable organisations. For many its biggest draw is the fact the members come from all walks of life and meets as equals whatever their race, religion or socio-economic position in society. Its values are based on integrity, kindness, honesty and fairness. Are you interested in joining Walnut Tree Lodge? We welcome decent, honest and trustworthy men who want to become Masons and learn about the history, secrets and mysteries of Freemasonry and who want to be a part of a worldwide fraternity whose members enjoy each other’s company and who are normally at least 21 years of age, (minimum age of 18 years old). If this is you, then you will certainly be welcomed. To learn who can become a freemason and how to be a freemason and a member of Walnut Tree Lodge, please see the Join Us page, or use the contact form to email the Lodge Secretary. We understand how difficult it may seem to contact someone you don’t know but you will always receive a warm and friendly welcome here at Walnut Tree Lodge. Please note that status or wealth are not important to freemasons or freemasonry. Neither are religion, colour, creed or sexual preferences. At Walnut Tree Lodge all suitable men are welcome. So if you would like to find out more about freemasons and our Lodge and how to become a freemason and join us, please don’t hesitate to get in touch. Our Membership. As a Lodge which is over 80 years old, we have many established traditions which we enjoy and embrace, but we are still flexible and willing to accept changes. Our ages ranges from 30’s to nearly 80. We have people in many different professions and jobs, some retired and so on. 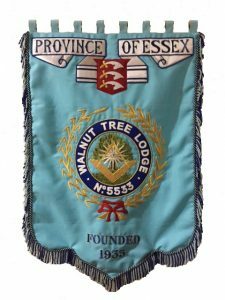 Walnut tree Lodge brethren generally live in Essex, but with some members now living in London, Suffolk, Scotland and some even further afield, i.e. in the USA. When and where. We meet formally four times a year on a Tuesday afternoon at The Square at Upminster in Deyncourt Gardens, Upminster. It is conveniently placed for access by road and rail. Our meetings usually start around 4:30pm and the following festive board finishes at about 9:30pm. There is plenty of parking there or Upminster Station is only a 5 minute walk away. Many other freemasons’ lodges also meet at this Masonic hall, for example Courtenay Lodge and Abbs Cross Royal Arch Chapter. Our Lodge of Instruction (which runs from September to June) is held on Wednesday evenings from 7:30 pm in Thurrock Cross Keys Masonic Centre. Timothy David John Jonck was Initiated and we also had a joining member W. Bro. Roy Brown. An explanation of the Working Tool was given by W. Bro. Chris Lees and the Charge by W. Bro. Brian Tyrrell both in a most excellent manner.After the meeting the brethren attended the festive board and enjoyed a fine hearty meal, amongst friends, new and old, together with lively conversation and entertaining toasts. Bro. Kevin Dark was Raised to the Third degree. W. Bro. Barrie Scriven took the Masters Chair. After the meeting the brethren attended the festive board and enjoyed a fine Christmas meal, amongst friends, new and old, together with lively conversation and entertaining toasts. the Mastership of the lodge passed again to W. Bro. Ricky Woods. We had a special guest present at this meeting, Asst Provincial Grand Master, Chas Elliott. The addresses to the Master, Wardens and the Brethren were delivered in a most excellent fashion. After the meeting the brethren attended the festive board and enjoyed a good hearty meal served amongst fellow Brethren, visitors and friends, together with witty conversation and sincere toasts. On the 12th June 2018. Bro. Kevin Dark was passed to the second degree. The explanation of the second degree tracing board was given by W. Bro. Barrie Scriven, and the Working Tools were presented by Bro. Adam Thomas, both in a most excellent manner. After the meeting the brethren attended the festive board and enjoyed a fine meal, amongst friends, new and old, and even a visitor from another Walnut Tree Lodge! Bro. Adam Thomas was raised to the third degree.The Traditional history and the 3rd Degree Working tools were given by W.Bro. Barrie Scriven, both in a most excellent manner. A Grand Lodge Certificate was excellently presented to Bro Bobby Prior by W. Bro Tony Barrett, from Chafford Lodge No. 5510. After the meeting the brethren attended the festive board and enjoyed a fine meal, amongst friends, new and old, and the usual lively conversation and toasts. Kevin Dark was initiated. The Working Tools were presented by Bro. Adam Thomas, and the Charge to the Initiate was given by W Bro Brian Tyrell, then Bro Trevor Taylor presented the Initiate with his white gloves and Bro Steve Traynor gave an explanation of the 1st Degree tracing board, all in a most excellent manner. After the meeting the brethren attended the festive board and enjoyed a fine Christmas meal, amongst friends, new and old, together with lively conversation and toasts. the Mastership of the lodge passed to W. Bro. Chris Lees. The address to the Master was delivered by W. Bro. Barrie Scriven, and the address to the Brethren by W. Bro. Brian Tyrrell both in a most excellent fashion. After the meeting the brethren attended the festive board and enjoyed a good hearty meal amongst fellow Brethren and friends, both new and old, together with witty conversation and jolly toasts. Bro. Bobby Prior was raised to the third degree.The Traditional history and the 3rd Degree Working tools were given by W.Bro. Barrie Scriven, both in a most excellent manner. An address from W. Bro. Colin Felton Prov.G.Ch.Stwd was well received. After the meeting the brethren attended the festive board and enjoyed a fine meal, amongst friends, new and old, together with lively conversation, a rather large raffle and the usual entertaining toasts. Bro. Adam Thomas was passed to the second degree.The explanation of the second degree tracing board was given by W. Bro. Barrie Scriven, and the Working Tools were presented by Bro. Bobby Prior both in a most excellent manner. After the meeting the brethren attended the festive board and enjoyed a fine meal, amongst friends, new and old, together with lively conversation, a rather biased raffle and entertaining toasts. Bro. Bobby Prior was passed to the second degree. W. Bro. Stuart St Clair-Haslam took the Masters Chair and the explanation of the second degree tracing board was given by W. Bro. Barrie Scriven, in a most excellent manner. After the meeting the brethren attended the festive board and enjoyed a fine Christmas meal, amongst friends, new and old, together with lively conversation and very entertaining toasts. the Mastership of the lodge passed to W. Bro. Ken Barnett. The address to the Master was delivered by W. Bro. Brian Tyrrell, the one to the Brethren by W. Bro. P. Nichols and that to the Wardens by Brian Tyrrell, all in a most excellent fashion. After the meeting the brethren attended the festive board and enjoyed a good hearty meal amongst fellow Brethren and friends, both new and old, together with witty conversation and toasts. Adam Thomas was initiated. The Working Tools were presented by W Bro. Paul Nichols, and the Charge to the Initiate was given by W Bro Brian Tyrell, both in a most excellent manner. After the meeting the brethren attended the festive board and enjoyed a good meal amongst friends, Visitors and Brothers new and old, together with lively conversation and a \'straight from the heart\' speech from our Honorary member W. Bro. Gerald Winstanley. Bobby James Prior was initiated. The Working Tools were presented by W Bro. Paul Nichols, and the Charge to the Initiate was given by W Bro Brian Tyrell, both in a most excellent manner. After the meeting the brethren attended the festive board and enjoyed a good meal amongst friends, Visitors and Brothers new and old, together with lively conversation and entertaining toasts. due to unforeseen circumstances, we had a practice run 1st degree with a W. Bro. as a worthy stand-in initiate. An explanation of the Working Tool was given by W. Bro. Paul Nichols and the Charge by W. Bro. Brian Tyrrell both in a most excellent manner. After the meeting the brethren attended the festive board and enjoyed a fine Christmas fare, amongst friends and visitors, new and old, together with lively conversation and entertaining toasts. the Mastership of the lodge passed to W. Bro. Stuart St Clair-Haslam. The address to the Master was delivered by W. Bro Barry Scriven, the one to the Brethren by W. Bro. Brian Tyrrell and that to the Wardens by W. Bro. P. Nicholls all in a most excellent fashion. After the meeting the brethren attended the festive board and enjoyed a good hearty meal amongst fellow Brethren and friends, both new and old, together with witty conversation and toasts. Bro. Michael Prior was Raised to the Third degree. The Traditional history was given by our Worshipful Master W.Bro. Barrie Scriven, & the 3rd Degree Working tools by W.Bro Paul Nicholls both in a most excellent manner. After the meeting the brethren attended the festive board and enjoyed a fine hearty meal, amongst friends new and old, together with lively conversation and toasts, with visitors from as far afield as Spain. Bro. Barrie John Strutt was raised to the third degree. An explanation of the traditional history was given by our Worshipful Master W. Bro. Barrie Scriven, in a most excellent manner. After the meeting the brethren attended the festive board and enjoyed a fine meal, amongst friends and visitors, new and old, together with lively conversation and entertaining toasts. For those who have regularly attended the Walnut Tree Lodge LoI’s we celebrated Christmas by dining in The Old White Horse in South Ockendon on Monday the 15th of December. No top table, no toasts and no speeches, just good old fashioned cheer and friendly banter was had and shared amongst good fellow friends – and one or two bottles of wine were also consumed as well. Bro. Michael Prior was passed to the second degree. An explanation of the second degree tracing board was given by Our worshipful Master W. Bro. Barrie Scriven, in a most excellent manner. After the meeting the brethren attended the festive board and enjoyed a fine Christmas meal, amongst friends, new and old, together with lively conversation and entertaining toasts. the Mastership of the lodge passed to W. Bro. Barrie Scriven. The address to the Master and Brethren was delivered by W. Bro. B. Tyrrell and that to the Wardens by W. Bro. P. Nicholls both in a most excellent fashion. After the meeting the brethren attended the festive board and enjoyed a good meal amongst friends, new and old, together with lively conversation and entertaining toasts. Walnut Tree Lodge in association with the Abbs Cross Chapter No. 6920 hosted it\'s 2nd Charity race night on Canvey Island. Another hugely successful race night, this time at Smallgains Hall, Island Boys Pavilion, Creek Road, Canvey Island, Essex, SS8 8QP. Thanks to Ian Taylor and every one involved in organising this event and thank you to all that turned up to make this a \'Big Fun on the Big Screen\' night and raise £850 for Charity. On the 14th August 2014, Walnut Tree Lodge No. 5533\'s brand new web site, www.walnuttreelodge.org.uk which gives our history, information and forth-coming events, has now been given formal approval from the Provincial Grand Lodge of Essex. So now we can publish this site and proudly carry the Provincial logo. Bro. Barrie John Strutt was passed to the second degree. APGM Peter Hammond and his DC Geoff Turpin were in attendance. An explanation of the second degree tracing board was given by W. Bro. Barrie Scriven, in a most excellent manner. After the meeting the brethren attended the festive board and enjoyed a good meal amongst friends, new and old, together with lively conversation. W.Bro. Ricky Wood and his Lady Lisa held their Ladies Night at the Hilton Hotel in Dartford, Kent. This was an excellent venue and the staff, who were highly professional, friendly and welcoming, ensured that it was a huge success for them and all of their guests. Great food was served and money raised for charity and finished off with a disco into the small hours of the night completing a perfect evening. Michael Samuel Prior was initiated. The Working Tools were presented by Bro. Robert Knapp, and the Charge to the Initiate was given by W Bro Brian Tyrell, both in a most excellent manner. A Grand Lodge Certificate was presented to Bro. Tony Mason by W. Bro. Ron Radley of the Sir Francis Drake Lodge No. 4240, in a most excellent manner. After the meeting the brethren attended the festive board and enjoyed a good meal amongst friends, new and old, together with lively conversation and entertaining toasts. Barrie John Strutt was initiated. A Grand Lodge Certificate was presented to Bro. Steven Howard by W. Bro. Ron Radley of the Sir Francis Drake Lodge No. 4240, in a most excellent manner. After the meeting the brethren attended the festive board and enjoyed a good meal amongst friends, new and old, together with lively conversation and entertaining toasts. the Mastership of the lodge passed to W. Bro. Ricky Wood. The address to the Master and Brethren was delivered by W. Bro. B. Tyrrell and that to the Wardens by W. Bro. P. Nicholls both in a most excellent way.